Credit Suisse today announced the results of its mid-year Hedge Fund Investor Sentiment Survey, which polled over 200 global institutional investors representing almost USD 700 billion in hedge fund investments. Participants were surveyed on their hedge fund activities during the first half of the year as well as strategy appetite and allocation plans for the second half of the year. This survey follows Credit Suisse’s Annual Global Investor Sentiment Survey that was conducted in January 2016. More than 80% of respondents reported redeeming from hedge funds in the first half of 2016. Some institutional investors, such as pension funds and endowments, had lower rates of redemptions than the average. 31% of pension funds surveyed had no redemptions, while 25% of endowments and foundations reported no redemption activity during the first half of the year. 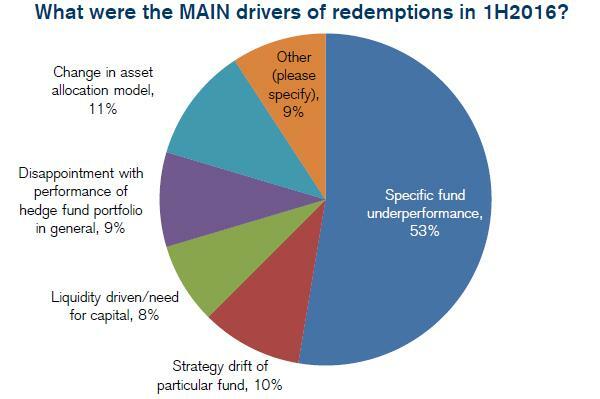 Redemptions were selective and targeted at specific funds, rather than reducing exposure to the industry as a whole – over 60% of those who redeemed were driven by specific manager underperformance or an individual fund’s strategy drift. 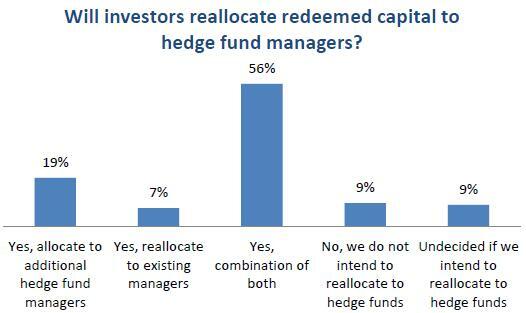 Of those investors who did redeem from hedge funds during the first half of the year, 82% expect to recycle that capital to other hedge fund managers rather than other asset classes (9% reported being undecided as to where to allocate the recycled capital). Looking ahead, 76% of US investors said that they would likely make allocations to hedge funds during the second half of the year. 86% of APAC investors and 64% of EMEA based investors indicated that they were also likely to do so. The commitment of US investors is the key one, given they make up a significant majority of capital flows to hedge funds. The main drivers of future allocations? Opportunistic allocation driven by strategy or manager performance (60%), or continued outperformance of current hedge fund allocations (12%). There are some regional differences in the demand for specific hedge fund strategies. 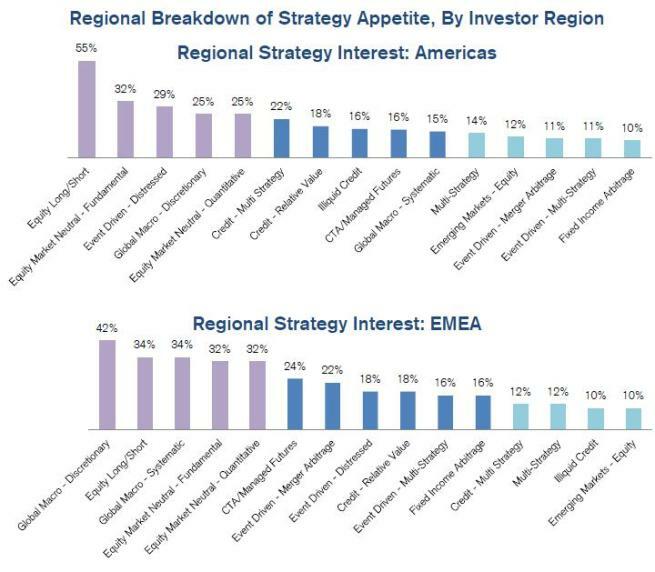 Credit related strategies are generally in more demand in the US than in Europe, and specifically a Distressed Investing fund is more likely to be bought by a US institutional investor than ones in Europe. The potential demand for market-neutral equity strategies reflects end-investors hedging of market directonality. With respect to preferred structures for investing in hedge funds (other than a traditional Master/Feeder), investors indicated interest in Liquid Alternatives (13%), Risk Premia vehicles (10%), Co-Investment opportunities (8%) and Long-Only funds (7%). Looking ahead, investors indicated the greatest appetite for Globally focused funds (67%) with investors also considering regional allocations to North America (57%), Developed Europe (41%) and then Asia-Pacific/ex-Japan (29%).